25/03/2019 - Bird netting going in soon, to be ready for macrophyte planting. 15/2/2019 – Pump house under construction. 14/12/2018 - Foundations have been prepared and the construction of stormwater structure has commenced. Fill is being imported from other ACT Healthy Waterways sites. 7/11/2018 – Earthworks have started. 13/8/2018 - Letters advising of the start of construction are being delivered to residents who live within a 100m radius of the site. Please check your letterbox. A new wetland beside Jerrabomberra Creek in Kingston will play a key role in improving water quality in the creek and in Lake Burley Griffin. 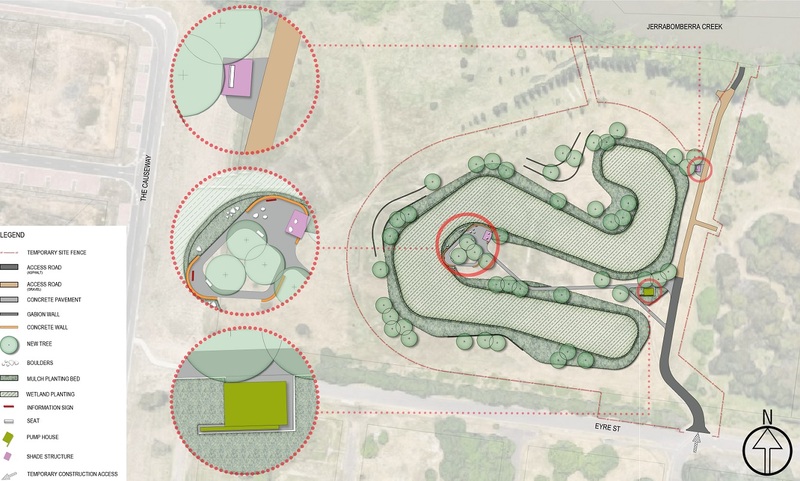 It is one of three ACT Healthy Waterways projects in the area that will bolster the work the now established Jerrabomberra Wetlands already does – filter stormwater before it flows into the Lake and provide habitat for the growing number of native animals and birds that call the wetlands home. The three new wetlands – at Eyre St in Kingston, Matina St in Narrabundah and off Diary Rd I Fyshwick – will remove a combined 114,000kg of nitrogen, phosphorous and suspended solids from stormwater every year. The Eyre St wetland is one of the biggest ACT Healthy Waterways projects with a treatment area of 6000 square metres. It will draw water from Jerrabomberra Creek for treatment. The site was previously a municipal waste site. Geotechnical and contamination investigations conducted during the design phase confirmed the likely presence of waste including gravel, concrete and steel but no hazardous materials. However, to avoid potential leaching and contamination, the wetland will be built on an impermeable base and constructed almost entirely in fill excavated from other sites. +Construction may be delayed by a number of factors, including bad weather. Planting is part of the construction phase and the timing of the growing season may impact on construction timelines. ^Water plants in particular may take up to two years to become established. The length of time may vary depending on ground and weather conditions. *Some areas of the site may remain closed to the public past this point to allow for additional planting or for plants to become established. The repositioning of the wetlands away from the creek edge to protect the riparian habitat. This move also allows for the future removal of the transmission towers and cables without damaging the wetlands. 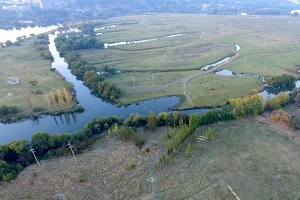 The reconfiguration of the wetlands to eliminate large open water areas or roosting islands that would attract large birds and increase the risk of bird strike at the nearby Canberra Airport. The replacement of through pathways for pedestrians and cyclists to separate users from riparian vegetation. The relocation of the pump station away from the noise-sensitive creek area. Any detours for traffic, walkers and cyclists will be in place and will be clearly signposted. The construction site will be fenced for public safety during the preparation, construction and establishment phases of the project.